The month of February often reminds us of sugary candy hearts, beautiful red roses, and candlelight dinners. More importantly, it should remind us to be more proactive when it comes to our health. February is National Heart Awareness Month, and one employee at The Children’s Center Rehabilitation Hospital is taking it to… well, heart. Jennifer Henry, a special education manager, has been by her husband’s side as he recovers from not one but three heart procedures. “I won a free heart scan from Integris Heart Hospital during The Children’s Center Rehabilitation Hospital’s wellness fair. My husband and I kept putting off the appointment, and finally, in December we had our scan,” said Jennifer. However, they weren’t ready for the results they received. 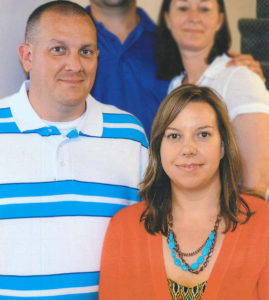 Erik, only 46-years-old, has a history of heart disease in his family. However, he never had any symptoms. The stress test results came back with concern, so Erik had an angiogram, which showed 70 percent blockage in three areas.